If I told you that I created something taking the technology from stealth bombers and Formula 1 racing cars, you'd probably think I was talking about a space ship. Nope, it's a golf club. 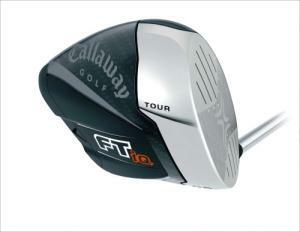 The FT-iQ Tour Driver is Callaway's latest golden child. This bad boy has more cutting edge technology than the Space Shuttle, the IPhone, and Donald Trump's hair gel combined. Let's check it out, shall we? Let's get to brass tacks here. This club is long and straight. You will bomb your drives like that of the aforementioned stealth bomber, although it won't be stealth as this does have that annoying tinny sound you get with these "new fandangled" drivers. I'm a purist when it comes to golf, and I've been slow to come around to the big square head drivers, but I do like this one. I like the look of the sleek black club head, and the visible weighting in the rear corners is very cool. This allows for a draw weighting for the standard model or a neutral weighting for the tour model. That being said, I'm going to hold onto my Titliest 907 driver as it doesn't have that annoying sound, and its sweet feel and workability is more my style.